DO I qualify for a Hospital Bed? At All Star Medical we have customers come into our stores to purchase mobility scooters and most don't have an idea of how they work so we spend time with them to show them the features and the pros and cons of each mobility scooter so they select the right one for their needs. Below are the top 5 things All Star Medical believes you should know when purchasing a mobility scooter. When purchasing a mobility scooter the biggest question I get asked is how much does it weigh and how am I going to transport it? Most mobility scooters have the ability to breakdown or fold up. The question you need to ask yourself is can I do this or will I have someone to help me with this? Scooters breakdown into multiple parts and the heaviest pieces weigh about 35 lbs and go up from there. There are a lot of folding scooters and they are great for transportation but they are one piece which weighs on average of 55 lbs. That 20 lbs can be a big difference so we recommend you come into one of our store locations and try to pick them up for yourself. Most mobility scooters come in a 3 wheel or 4 wheel version. The biggest difference is the turning radius which can be up to 10 inches different. This is a big deal when you are trying to use the scooter in confined space. This is where at All Star Medical we ask you where will you use the scooter at and where do you see yourself in 1 to 2 years, will you need it inside your home, will you have to use it full time? Can I use my mobility scooter outside? At All Star Medical we get this question all the time and the answer is YES. Now that doesn't mean you can go along side your buddy in his ATV, we have to use some common sense and realize that these mobility scooters have limits. 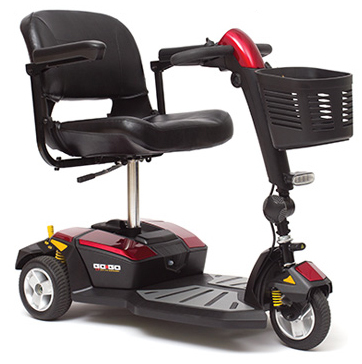 You can get mobility scooters that have very large wheels and can go on the grass but you are not going to fit them into your house unless you have a very large open floor plan. Below are some outdoor scooters along with some that can do both. I hope this was helpful. You can click on the images to go directly to the pages of these mobility scooters.Call us or stop by one of our convenient Nashville Tennessee locations.